Climate change in the Arctic is happening so quickly that the Norwegian Government has been forced to spend $AU17 million to fix a subterranean vault that is preserving the world’s seeds. The Global Seed Vault, better known as the Doomsday Vault, stores seeds from 40 per cent of plant species from around the world on the remote Svalbard archipelago, a little more than 1,000 kilometres from the North Pole. Australia has about 45,000 varieties crucial to the grain and livestock industries in the vault. But the changing Arctic climate means design assumptions made when the vault was built 10 years ago are no longer valid. “In Svalbard we have observed climate change over quite a few years now, and what happens is the temperature gets higher and we get more snow and rain than we have had before,” said Synnove Sandberg, director of the Norwegian state-owned construction company Statsbygg, which is carrying out the repair work. That has resulted in water getting into the access tunnel, which runs from the surface under a mountain to the vault. “The seeds in the vault have never, ever been at any kind of threat,” said Maria Haga, executive director of the global Crop Trust, one of three organisations that manage the vault. Ms Haga said the vault upgrade would deliver a fully waterproof vault to store the world’s seeds. “This whole idea of the seed vault builds on trust,” she said. The Global Seed Vault was not set up for a doomsday scenario, but rather to preserve genetic diversity in crops that feed the world, which is quickly being lost as farmers grow only a few varieties of major crops. 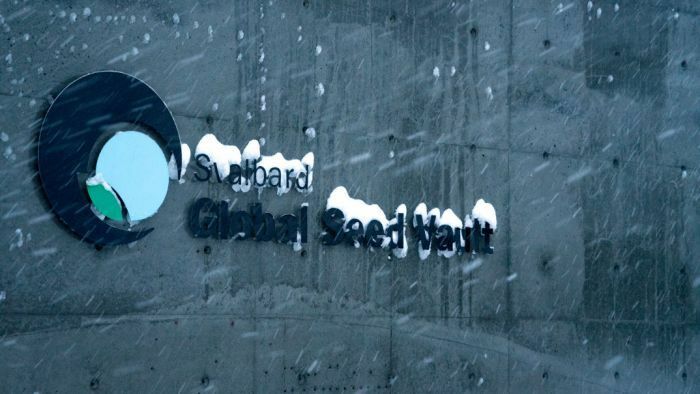 When a seedbank was destroyed in the Syrian civil war, the lost seeds were able to be replaced because they had been “backed up” in Svalbard. Ms Sandberg said the pace of climate change in the Arctic was creating challenges for the Norwegian Government in other areas, not just in the vault. She said construction methods had to change across the region. “The annual average temperature may raise from minus 5.9 degrees today to plus 3.3 degrees in 2100,” she said. Norwegian Polar Institute international director Kim Holmen said the pace of climate change in the Arctic was dramatic. “We are seeing temperatures going up, the winter time temperatures tremendously. We see less ice on the ocean, no ice at all on the fjords when there should be,” he said. “We see snow melting earlier in the spring, glaciers thinning, eco-systems changing. ABC Alice Springs reporter Steven Schubert travelled to Norway with assistance from the Crawford Fund.